If you are an Internet user, then you may have heard the term “Web 2.0”. To understand “Web 2.0” then you have to understand what “web 1.0” means first. Web 1.0 is the period of time where companies/organizations were just getting online. This beginning period of the Internet (Web 1.0) has been declared in many circles as the period between 1994 – 2002. This era was companies giving consumers the communication channel to contact them on the World Wide Web. Web 2.0 is the current period of the Internet revolution starting in 2003 until present day marked by improving their consumer experience. Now companies just don’t want to be online, they want to talk to their users online. The following chart helps exemplify how companies are accomplishing this task. Some of the ways they are talking to you are through blogs, viral videos, message boards, online chat and many more. 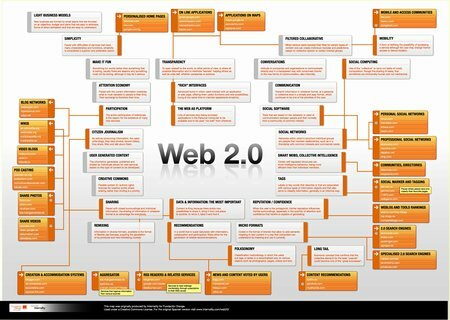 Check out this Web 2.0 Chart for a closer look. ← How Patriotic Are You?